Here is a book that can be a real life-saver! 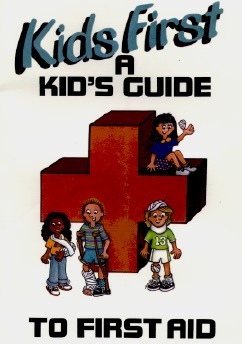 Kids First: A Kid's Guide to First Aid is an educational book for young children, aged 5 to 10, and their families. It provides basic information on germs as well as taking care of cuts and scrapes, burns, choking, something in the eye, nosebleeds, burning clothing and breaks and sprains. The book is the creation of Beth Kent-Astrella, R.N. and Angie Leonard, R.N., with illustrations by Carol Kent Williams. In an easy-to-use text and illustration format, the child can read about a potential problem and see how a group of children did the right things until an adult could help. In the illustration below, a boy burns his hand on his marshmellow. When any child flips the half-page, they see the solution: running cold water directly on the burned spot. Children will enjoy reviewing the first aid skills and filling in their own emergency phone list with their families. A necessary reference for every household with small children.